Intraperitoneal gas may leak into several extraperitoneal tissue planes or spaces. Subcutaneous emphysema is the most common site. Etiology of extraperitoneal gas collections may be a technical error such as incorrect insufflation due to superficial needle placement, excessive intra-abdominal pressure, or a malfunctioning insufflator. However, subcutaneous emphysema most commonly occurs due to leakage around a laparoscopic port. Subcutaneous gas is a risk factor for hypercapnia, so its presence should prompt an assessment for hypercapnia and its effects. Gas insufflation into the preperitoneal space or omentum is usually not a concern (although it may also increase the risk of hypercapnia) unless it occurs during the initial Veress needle placement in which case it might interfere with subsequent laparoscopic visualization. 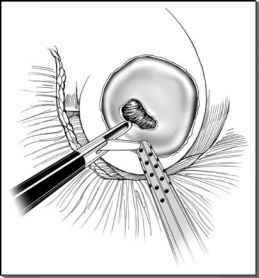 Preperitoneal insufflation is occasionally the cause for aborting a laparoscopic procedure (117). Spontaneous pneumomediastinum and pneumothorax may occur during laparoscopy without any evidence of diaphragmatic injury (Fig. 5) (142-145). Although usually with no clinical significance, they can inhibit cardiac filling and limit lung excursion. Fatality has been reported (146). FIGURE 5 ■ Portable antero-posterior chest radiograph demonstrating extensive subcutaneous emphysema, pneumomediastinum (blackarrowheads), and bilateral pneumothoraces (white arrowheads) found after laparoscopic pyeloplasty with no evidence of diaphragm injury. Intraperitoneal gas is still present. Source: From Ref. 145. If CO2 or N2O has been insufflated, the pneumothorax usually will resolve. Thoracostomy should be performed to manage a large or symptomatic pneumothorax. patients undergoing extraperitoneal laparoscopy and in 6% of patients after transperitoneal laparoscopy (51,94). If CO2 or N2O has been insufflated, the pneumothorax usually will resolve (147). Thoracostomy should be performed to manage a large or symptomatic pneumothorax. Pneumopericardium has also been reported after laparoscopy (142). 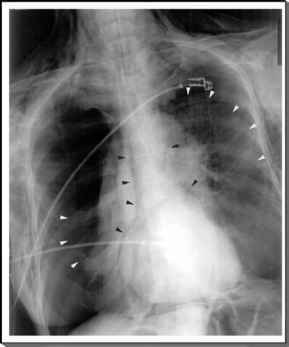 Subcutaneous gas has been present in all reported cases of pneumopericardium, and in most cases, there has been radiographic evidence of pneumomediastinum as well. The entry of mediastinal gas into the pericardial space alongside blood vessels is the most likely mechanism, although persistent embryological pleuropericardial and pericardioperi-toneal connections would also allow gas into the pericardium.